Looking for budget-friendly and economic advertising with global audience reach? In a technologically advanced era where everyone is glued to their phones and use the internet and about 3.03 billion people are on social media around the globe, digital advertising is a worth-while investment that is sure to generate leads and attract consumers. 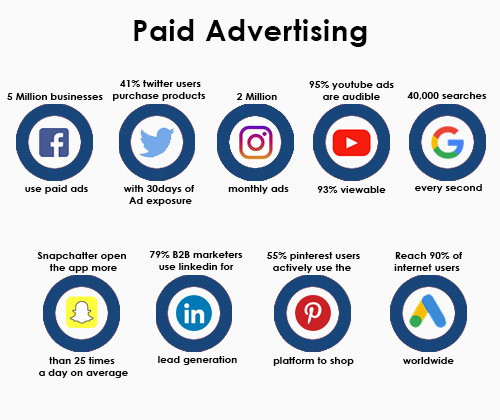 Why spend massive amounts of money on traditional advertising when you can spread your advertisements to any location gloabally through digital media and reach a higher number of target audience at a lesser cost? Make your brand well-known by engaging various digital marketing techniques that will boost your overall business performance. GET STARTED WITH A LOW-COST YET HIGHLY EFFECTIVE OPTION OF PAID MARKETING TODAY! People who search for various products and services on the internet reveal their intent through keywords used. In Internet marketing, we tap into that resource. Search advertising is a method of placing online advertisements on web pages that show results from search engine queries. Ads can also be placed on web pages with other published content. This increases your digital presence and enables you to engage wth consumers who are already looking for you. Also known as banner advertising, is a form of advertising that conveys a commercial message visually using text, logos, animations, videos, photographs, or other graphics. Human nature is to get attracted to colours and pictures as compared to text and that is why many people opt for display advertising. This has a high engagement rate and also widens the scope of creativity, allowing you to stand out in the market. Why hunt for your consumers when they come looking for you? Lead ads are the best way to run lead generation campaigns on social media or the digital market. Lead ads let people show their interest in a product or service by filling out a form in the ad with their details and allowing a business to follow up with them. These are nothing but a type of ad that features detailed information about specific products that you sell along with illustrations and pictures. Shopping ads can refer to Product Shopping ads, which feature just one product, or Showcase Shopping ads, which feature several related products. This helps you choose the way you portray your product to your target audience on a large scale. These types of ads play a vital role in branding your company and attracting consumers. Remarketing is a way to connect with people who previously interacted with your website or mobile app or social media. It allows you to strategically position your ads in front of these audiences as they browse Google or its partner websites, thus helping you increase your brand awareness or remind those audiences to make a purchase. It is a prompt focused and efficient manner of advertising that enables you to reach your target audicence. One of the major benefits of advertising on a social networking site (e.g. Facebook, LinkedIn) is that advertisers can take advantage of the users demographic information and target their ads appropriately. Social media advertising combines current targeting options like geotargeting and behavioral targeting to make detailed target group identification possible which in turn makes it easier for businesses to function smoothly.